Not to be confused with Kodiak. For the company that owns the surviving photographic assets, based in Hertfordshire UK, see Kodak Alaris. Kodak 35mm film cartridge alongside Asahi Pentax film camera. The shift from film to digital greatly affected Kodak's business. The Eastman Kodak Company (referred to simply as Kodak /ˈkoʊdæk/) is an American technology company that produces camera-related products with its historic basis on photography. The company is headquartered in Rochester, New York, and is incorporated in New Jersey. Kodak provides packaging, functional printing, graphic communications and professional services for businesses around the world. Its main business segments are Print Systems, Enterprise Inkjet Systems, Micro 3D Printing and Packaging, Software and Solutions, and Consumer and Film. It is best known for photographic film products. Kodak was founded by George Eastman and Henry A. Strong on September 4, 1888. During most of the 20th century, Kodak held a dominant position in photographic film. The company's ubiquity was such that its "Kodak moment" tagline entered the common lexicon to describe a personal event that was demanded to be recorded for posterity. Kodak began to struggle financially in the late 1990s, as a result of the decline in sales of photographic film and its slowness in transitioning to digital photography, despite developing the first self-contained digital camera. As a part of a turnaround strategy, Kodak began to focus on digital photography and digital printing, and attempted to generate revenues through aggressive patent litigation. In January 2012, Kodak filed for Chapter 11 bankruptcy protection in the United States District Court for the Southern District of New York. In February 2012, Kodak announced that it would stop making digital cameras, pocket video cameras and digital picture frames and focus on the corporate digital imaging market. Digital cameras are still sold under the Kodak brand by JK Imaging Ltd thanks to an agreement with Kodak. 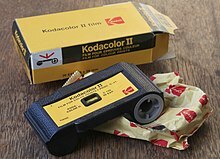 In August 2012, Kodak announced its intention to sell its photographic film, commercial scanners and kiosk operations, as a measure to emerge from bankruptcy, but not its motion picture film operations. In January 2013, the Court approved financing for Kodak to emerge from bankruptcy by mid 2013. 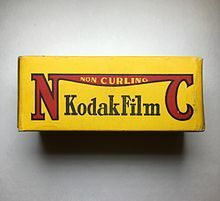 Kodak sold many of its patents for approximately $525,000,000 to a group of companies (including Apple, Google, Facebook, Amazon, Microsoft, Samsung, Adobe Systems, and HTC) under the names Intellectual Ventures and RPX Corporation. On September 3, 2013, the company emerged from bankruptcy having shed its large legacy liabilities and exited several businesses. Personalized Imaging and Document Imaging are now part of Kodak Alaris, a separate company owned by the UK-based Kodak Pension Plan. 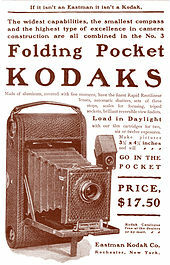 From the company's founding by George Eastman in 1888, Kodak followed the razor and blades strategy of selling inexpensive cameras and making large margins from consumables – film, chemicals, and paper. As late as 1976, Kodak commanded 90% of film sales and 85% of camera sales in the U.S.
Japanese competitor Fujifilm entered the U.S. market (via Fuji Photo Film U.S.A.) with lower-priced film and supplies, but Kodak did not believe that American consumers would ever desert its brand. Kodak passed on the opportunity to become the official film of the 1984 Los Angeles Olympics; Fuji won these sponsorship rights, which gave it a permanent foothold in the marketplace. Fuji opened a film plant in the U.S., and its aggressive marketing and price cutting began taking market share from Kodak. Fuji went from a 10% share in the early 1990s to 17% in 1997. Fuji also made headway into the professional market with specialty transparency films such as Velvia and Provia, which competed successfully with Kodak's signature professional product, Kodachrome, but used the more economical and common E-6 processing machines which were standard in most processing labs, rather than the dedicated machines required by Kodachrome. Fuji's films soon also found a competitive edge in higher-speed negative films, with a tighter grain structure. In May 1995, Kodak filed a petition with the US Commerce Department under section 301 of the Commerce Act arguing that its poor performance in the Japanese market was a direct result of unfair practices adopted by Fuji. The complaint was lodged by the United States with the World Trade Organization. On January 30, 1998, the WTO announced a "sweeping rejection of Kodak's complaints" about the film market in Japan. Kodak's financial results for the year ending December 1997 showed that company's revenues dropped from $15.97 billion in 1996 to $14.36 billion in 1997, a fall of more than 10%; its net earnings went from $1.29 billion to just $5 million for the same period. Kodak's market share declined from 80.1% to 74.7% in the United States, a one-year drop of five percentage points that had observers suggesting that Kodak was slow to react to changes and underestimated its rivals. The Kodak 'K' logo was introduced in 1971. The version seen here – with the 'Kodak' name in a more modern typeface – was used from 1987 until the logo's discontinuation in 2006. A revised version was reintroduced in 2016. Despite the high growth, Kodak failed to anticipate how fast digital cameras became commodities, with low profit margins, as more companies entered the market in the mid-2000s. In 2001 Kodak held the No. 2 spot in U.S. digital camera sales (behind Sony) but it lost $60 on every camera sold, while there was also a dispute between employees from its digital and film divisions. The film business, where Kodak enjoyed high profit margins, fell 18% in 2005. The combination of these two factors resulted in disappointing profits overall. Its digital cameras soon became undercut by Asian competitors that could produce their offerings more cheaply. Kodak had a 27% market-leading share in 1999, that dwindled to 15% by 2003. In 2007 Kodak was No. 4 in U.S. digital camera sales with a 9.6% share, and by 2010 it held 7% in seventh place behind Canon, Sony, Nikon, and others, according to research firm IDC. Also an ever-smaller percentage of digital pictures were being taken on dedicated digital cameras, being gradually displaced in the late 2000s by cameras on cellphones, smartphones, and tablets. Kodak then began a strategy shift: Previously Kodak had done everything in-house, but CEO Antonio Pérez shut down film factories and eliminated 27,000 jobs as it outsourced its manufacturing. Pérez invested heavily in digital technologies and new services that capitalized on its technology innovation to boost profit margins. He also spent hundreds of millions of dollars to build up a high-margin printer ink business to replace shriveling film sales. Kodak's ink strategy rejected the razor and blades business model used by the dominant market leader Hewlett-Packard in that Kodak's printers were expensive but the ink was cheaper. As of 2011, these new lines of inkjet printers were said to be on verge of turning a profit, although some analysts were skeptical as printouts had been replaced gradually by electronic copies on computers, tablets, and smartphones. Home photograph printers, high-speed commercial inkjet presses, workflow software, and packaging were viewed as the company's new core businesses, with sales from those four businesses projected to double to nearly $2 billion in revenue in 2013 and account for 25% of all sales. However, while Kodak named home printers as a core business as late as August 2012, at the end of September declining sales forced Kodak to announce an exit from the consumer inkjet market. On March 12, 2014, Kodak announced that Jeffrey J. Clarke had been named as chief executive officer and a member of its board of directors. On January 1, 2015, Kodak announced a new five business division structure; Print Systems, Enterprise Inkjet Systems, Micro 3D Printing and Packaging, Software and Solutions, and Consumer and Film. In October 2018, the company added a licensee to AMB Media to create the KODAK Digitizing Box. 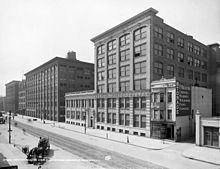 April 1880: George Eastman leased the third floor of a building on State Street in Rochester N.Y. and began the commercial manufacture of dry plates. 1885: George Eastman bought David Houston's patents for roll film and developed them further. These were the basis for the invention of motion picture film, as used by early filmmakers and Thomas Edison. 1898: George Eastman purchased the patent for Velox photographic paper from Leo Baekeland for $1,000,000. After this time, Velox paper was then sold by Eastman Kodak. 1908: Kodak acquires the exclusive right to supply film stock for the MPPC cartel. A similar attempt to secure an arrangement with European producers at the Paris Film Congress the following year falls through when French courts rule it illegal. 1932: George Eastman dies at age 77, taking his own life with a gunshot. The suicide note he leaves behind reads, "My work is done. Why wait?" 1978: Kodak introduces the Ektachem clinical chemistry testing system. The system employs dry film technology, and within 5 years was being used by most hospitals in the country. 1994: Apple Quicktake, a consumer digital camera was debuted by Apple Computer. Some models were manufactured by Kodak. January 2005: Kodak acquired the Burnaby, British Columbia, Canada-based company Creo. February 9, 2012: Kodak announced that it would exit the digital image capture business, phasing out its production of digital cameras. Kodak sees home photo printers, high-speed commercial inkjet presses, workflow software and packaging with GlobalVision software integrated, as the core of its future business. Once the digital camera business is phased out, Kodak said its consumer business will focus on printing. It will seek a company to license its EasyShare digital camera brand. October 17, 2013 Kodak brings European headquarters and the entire EAMER Technology Centre under one roof in Eysins, Switzerland. The relocation brings together the company's European headquarters and Inkjet demo facilities, which were based in Gland, Switzerland, and the Kodak EAMER Technology and Solutions Centre, which was based in La Hulpe, Belgium. December 2014, Kodak announced its first phone, the Kodak Ektra smartphone made by Bullitt Group. The phone was expected to become available in December 2016, initially in Europe. January 2016, Kodak shows off a prototype of the new Super 8 Camera at CES. January 2017, Kodak announced it was bringing back its Ektachrome film. May 2017, Kodak released the Ektra smartphone to the US market. June 2017, Kodak announced plans to release 7" and 10" tablets with ARCHOS in Europe. September 2018, Kodak announced that the 135 and Super 8 format of Ektachrome is available again, with 16mm available later. Kodak provides packaging, functional printing, graphic communications and professional services for businesses around the world. Its main business segments are Print Systems, Enterprise Inkjet Systems, Micro 3D Printing and Packaging, Software and Solutions, and Consumer and Film. In January 2018, Kodak announced plans to launch KodakCoin, a photographer-oriented blockchain cryptocurrency. In 1997, Heidelberg Printing Machines AG and Eastman Kodak Co. had created the Nexpress Solutions LLC joint venture to develop a digital color printing press for the high-end market segment. Heidelberg acquired Eastman Kodak Co.'s Office Imaging black and white digital printing activities in 1999. In 2000, they had launched Digimaster 9110 - Black & White Production Printer and NexPress 2100 Digital Color Press. At present, Kodak has commercial Web-fed presses, commercial imprinting systems - Prosper, VersaMark and commercial sheet-fed press - NexPress digital production color press, DIGIMASTER HD digital black and white production printer. The company helped set the standard of 35mm film, and introduced the 16mm film format for home movie use and lower budget film productions. The home market-oriented 8mm and Super 8 formats were also developed by Kodak. Kodak also entered the professional television production video tape market, briefly in the mid-1980s, under the product portfolio name of Eastman Professional Video Tape Products. In 1990, Kodak launched a Worldwide Student Program working with university faculty throughout the world to help nurture the future generation of film-makers. Kodak formed Educational Advisory Councils in the US, Europe and Asia made up of deans and chairs of some of the most prestigious film schools throughout the world to help guide the development of their program. Aside from technical phone support for its products, Kodak offers onsite service for other devices such as document scanners, data storage systems (optical, tape, and disk), printers, inkjet printing presses, microfilm/microfiche equipment, photograph kiosks, and photocopiers, for which it despatches technicians who make repairs in the field. On January 13, 2004, Kodak announced it would stop marketing traditional still film cameras (excluding disposable cameras) in the United States, Canada and Western Europe, but would continue to sell film cameras in India, Latin America, Eastern Europe and China. By the end of 2005, Kodak had ceased manufacturing cameras that used the Advanced Photo System. Kodak licensed the manufacture of Kodak branded cameras to Vivitar in 2005 and 2006. After 2007 Kodak did not license the manufacture of any film camera with the Kodak name. As part of its move toward higher end products, Kodak announced on September 15, 2006 that the new Leica M8 camera incorporates Kodak's KAF-10500 image sensor. This was the second recent partnership between Kodak and the German optical manufacturer. In 2011, Kodak sold its Image Sensor Solutions business to Platinum Equity, which subsequently renamed it Truesense Imaging, Inc. The Kodak DCS series of digital single-lens reflex cameras and digital camera backs were released by Kodak in the 1990s and 2000s, and discontinued in 2005. They were based on existing 35mm film SLRs from Nikon and Canon and the range included the original Kodak DCS, the first commercially available digital SLR. Kodak provides scanning technology. Historically this industry began when George Eastman partnered with banks to image checks in the 1920s. Through the development of microfilm technology, Eastman Kodak was able to provide long term document storage. Document imaging was one of the first imaging solutions to move to "digital imaging" technology. Kodak manufactured the first digital document scanners for high speed document imaging. Today Kodak has a full line of document scanners for banking, finance, insurance, healthcare and other vertical industries. Kodak also provides associated document capture software and business process services. Eastman Kodak acquired the Bowe Bell & Howell scanner division in September 2009. Kodak continues to produce specialty films and film for newer and more popular consumer formats, but it has discontinued the manufacture of film in older and less popular formats. He and his mother devised the name Kodak using an Anagrams set. Eastman said that there were three principal concepts he used in creating the name: it should be short, easy to pronounce, and not resemble any other name or be associated with anything else. manufacturing facilities used to be sited at Harrow in north-west London (closed in 2016), Kirkby near Liverpool (closed in 2007) and Annesley in Nottinghamshire (closed in 2005). In 2005, Kodak Canada donated its entire historic company archives to Ryerson University in Toronto, Ontario, Canada. The Ryerson University Library also acquired an extensive collection of materials on the history of photography from the private collection of Nicholas M. & Marilyn A. Graver of Rochester, New York. The Kodak Archives, begun in 1909, contain the company's Camera Collection, historic photos, files, trade circulars, Kodak magazines, price lists, daily record books, equipment, and other ephemera. It includes the contents of the Kodak Heritage Collection Museum, a museum established in 1999 for Kodak Canada's centennial that Kodak closed in 2005 along with the company's entire 'Kodak Heights' manufacturing campus in Mount Dennis, Toronto. See also: George Eastman House. ^ a b c "History of Kodak". Kodak. Archived from the original on January 7, 2012. Retrieved January 20, 2012. ^ "Certificate of amendment to the restated certificate of incorporation of Eastman Kodak company" (PDF). New Jersey division of revenue. June 8, 2005. Retrieved January 7, 2008. ^ a b "DISCLOSURE STATEMENT FOR DEBTORS' JOINT PLAN OF REORGANIZATION UNDER CHAPTER 11 OF THE BANKRUPTCY CODE". April 30, 2013. Retrieved October 1, 2013. ^ a b "Kodak Announces Emergence From Bankruptcy". September 3, 2013. Retrieved October 2, 2013. ^ a b c "Kodak creating new business divisions". Rochester Democrat and Chronicle. Retrieved 2016-12-30. ^ Rees, Jasper (January 20, 2012). "The end of our Kodak moment". London: The Telegraph. Retrieved January 20, 2012. ^ a b c d Hiltzik, Michael (December 4, 2011). "Kodak's long fade to black". Los Angeles Times. Retrieved December 11, 2011. ^ a b c d "Kodak embraces digital revolution". BBC News. January 13, 2004. Retrieved March 29, 2010. ^ a b Mattioli, Dana (April 19, 2010). "At Kodak, Patents Hold the Key to the Future". The Wall Street Journal. Dow Jones & Company. Retrieved July 8, 2011. ^ a b "Kodak files for bankruptcy, plans biz overhaul". Business Standard. Retrieved January 19, 2012. ^ a b c d McCarty, Dawn; Jinks, Beth (January 19, 2012). "Kodak Files for Bankruptcy Protection". Bloomberg. Retrieved January 19, 2012. ^ a b c "Eastman Kodak Files for Bankruptcy". The New York Times. January 19, 2012. Retrieved January 19, 2012. ^ "Kodak announces plans to sell still film, commercial scanner, and kiosk divisions". The Verge. Retrieved August 24, 2012. ^ Gilbert, Ben (January 23, 2013). "Court approves Kodak financing, could exit bankruptcy by mid-2013". Engadget.com. Retrieved March 3, 2013. ^ "The Rise and Fall of the Company that Invented Digital Cameras| Patents & Patent Law". IPWatchdog.com | Patents & Patent Law. 2014-11-01. Retrieved 2017-05-24. ^ "Kodak sells its imaging patents for $525M". CNET. Retrieved 2017-05-24. ^ a b c "Kodak bankruptcy officially ends". USA Today. September 3, 2013. Retrieved October 1, 2013. ^ "Kodak emerges from bankruptcy with focus on commercial printing". Reuters. September 3, 2013. Retrieved October 1, 2013. ^ Lucas, Henry C. (2012). The Search for Survival: Lessons from Disruptive Technologies. ABC-CLIO. p. 16. ISBN 9781440802775. Retrieved May 12, 2016. ^ a b "The last Kodak moment?". The Economist. January 14, 2012. Retrieved September 28, 2016. ^ World Trade Organization. "DS44 Japan — Measures Affecting Consumer Photographic Film and Paper". WTO. Retrieved January 23, 2012. ^ "The Kodak - Fuji Rivalry | Business Strategy Case Studies | Business, Management Strategies Cases | Case Study". Icmrindia.org. Retrieved January 19, 2012. ^ a b "fujicasestudy" (PDF). Retrieved January 19, 2012. ^ "Evolution of our brand logo". Eastman Kodak. Archived from the original on February 25, 2012. Retrieved June 3, 2016. ^ "Kodak's Last Days". nst.com. February 5, 2012. Archived from the original on March 15, 2012. Retrieved March 14, 2012. ^ "Steven Sasson named to CE Hall of Fame". letsgodigital.org. September 18, 2007. Retrieved March 14, 2012. ^ a b c "Mistakes Made On The Road To Innovation". Businessweek.com. November 27, 2006. Retrieved January 19, 2012. ^ "Kodak: Mistakes Made on the Road to Innovation". Bloomberg. September 17, 2007. Retrieved December 20, 2016. ^ Jinks, Beth; Childs, Mary (January 20, 2012). "Kodak Bankruptcy May Shed Photography, Bet on Digital Printing". Bloomberg. ^ a b "Kodak:What led to bankruptcy - Hindustan Times". HindustanTimes.com. January 22, 2012. Retrieved January 31, 2014. ^ Scheyder, Ernest (December 24, 2011). "As Kodak struggles, Eastman Chemical thrives". Reuters. Retrieved January 19, 2012. ^ "Kodak, Yahoo and RIM: Death comes for us all". News. CBS. Retrieved January 19, 2012. ^ a b Martin, Andrew (October 20, 2011). "Kodak's Bet on Its Printers Fails to Quell the Doubters". The New York Times. ^ a b "Kodak quits printers, wants new deadline". USA Today. September 28, 2012. Retrieved September 29, 2012. ^ a b "Kodak may file for bankruptcy". IBNLive (Report). IN. Retrieved January 19, 2012. ^ Haunss, Kristen (January 13, 2012). "Kodak Said in Talks With Citigroup on Bankruptcy Financing". Bloomberg. Retrieved January 19, 2012. ^ "Kodak gets 2013 deadline to reorganise". IBNLive. IN. Retrieved January 21, 2012. ^ 明, 星编辑 (April 19, 2013). "P&E：单电外观曝光 柯达重现展会现场" (in Chinese). CN: Zol. ^ "New pictures of the Kodak S1 MFT camera…". Four Thirds Rumors. April 25, 2013. ^ "Jeff Clarke Elected CEO of Kodak". March 12, 2014. ^ a b "Kodak Names Tech Veteran as CEO". The Wall Street Journal. March 12, 2014. Retrieved March 12, 2014. ^ a b "Kodak Names Oribitz Chairman Clarke as New CEO". Bloomberg. March 12, 2014. ^ "Eastman Kodak Company: Private Company Information - Bloomberg". www.bloomberg.com. Retrieved 2017-08-21. ^ "Kodak at Your Doorstep with The New Digitizing Box". Kodak.com. October 9, 2018. ^ "Preserve Your Family Moments Digitally". 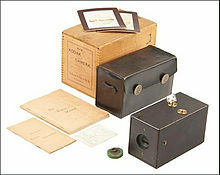 KODAK Digitizing Box. October 9, 2018. ^ "Almanac: The birth of Kodak". CBS News. September 4, 2011. Retrieved September 3, 2012. ^ a b c d This article incorporates text from a publication now in the public domain: Rines, George Edwin, ed. (1920). "Kodak" . Encyclopedia Americana. ^ Coe, Brian (1978). Cameras. Crown Publishing, Inc. ISBN 0-517-53381-2. ^ Gordon, John Steele (October 2003). "What digital camera makers can learn from George Eastman". American Heritage. Archived from the original on December 13, 2007. Retrieved January 7, 2008. ^ Brayer, Elizabeth (1996). George Eastman. The Johns Hopkins University Press. ISBN 0-8018-5263-3. ^ a b "Dow Jones Industrial Average History" (PDF). Dow Jones Indexes. Archived from the original (PDF) on May 28, 2008. Retrieved June 15, 2008. ^ O. G. Peterson, S. A. Tuccio, B. B. Snavely, CW operation of an organic dye solution dye laser, Appl. Phys. Lett. 42, 1917-1918 (1970). ^ "As Kodak struggles, Eastman Chemical thrives". Reuters. December 24, 2011. Retrieved December 26, 2011. ^ "Kodak To Buy Sterling Drug". tribunedigital-chicagotribune. ^ C. H. Chen, J. L. Fox, F. J. Duarte, Lasing characteristics of new-coumarin-analog dyes: broadband and narrow-linewidth performance, Appl. Opt. 27, 443-445 (1988). ^ Black, Larry (June 16, 1993). "Kodak to spin off chemicals: Eastman will become independent by the end of this year". London: The Independent. Retrieved January 21, 2012. ^ "One Eastman Chemical share set for 4 of Kodak". The New York Times. December 11, 1993. Retrieved January 21, 2012. ^ "Kodak acquires Algotec for $42.5 million". The Engineer. November 18, 2003. ^ "Kodak cuts 15,000 jobs worldwide". BBC News. January 22, 2004. Retrieved January 2, 2012. ^ Teather, David (January 23, 2004). "Kodak pulls shutter down on its past". London: The Guardian. Retrieved January 2, 2012. ^ "Kodak To Market Lexar Memory Cards". Forbes. May 17, 2004. ^ "Kodak to Purchase OREX, Leader in Computed Radiography Products for Specialty Markets". Diagnostico Journal. January 18, 2005. Archived from the original on April 26, 2012. ^ Sullivan, Terry (April 25, 2006). "Kodak's Small, Sleek…Superzoom?". PC Mag. Retrieved December 19, 2011. ^ "Kodak intros wireless digital cameras". Macworld. April 25, 2006. Retrieved December 19, 2011. ^ "Kodak Posts a Wider Loss". The New York Times. August 2, 2006. Retrieved January 2, 2012. ^ "Slumping film sales leave Kodak figures deep in red". London: The Guardian. August 2, 2006. Retrieved January 2, 2012. ^ "Kodak to Sell Health Group to Onex for up to $2.55 billion". Eastman Kodak. January 10, 2007. Archived from the original on October 13, 2007. Retrieved January 7, 2008. ^ "Kodak Completes Sale of Health Group to Onex". Eastman Kodak. May 1, 2007. Archived from the original on October 13, 2007. Retrieved January 7, 2008. ^ "Rohm and Haas to buy Kodak's light management films unit". Reuters. April 19, 2007. Retrieved January 22, 2012. ^ "Chi Mei, Kodak ink deal to make slimmer screens". Taipei Times. May 26, 2007. Retrieved January 15, 2012. ^ "Color Filter Array 2.0". June 14, 2007. Archived from the original on July 20, 2007. ^ "Press Release: Kodak and Lexar Announce New Extended Five-Year Agreement". Eastman Kodak. September 4, 2007. Retrieved December 9, 2008. ^ Boehret, Katherine (November 26, 2008). "Family Snapshots in the Splendor of HD". The Wall Street Journal. ^ Paul, Franklin (January 29, 2009). "Kodak to cut up to 4,500 jobs". Reuters.com. Retrieved January 19, 2012. ^ "Kodak Will Retire Kodachrome, Its Oldest Color Film Stock". The New York Times. June 22, 2009. Retrieved December 26, 2011. ^ Topping, Alexandra (June 23, 2009). "Mama, they've taken away my nice bright Kodachrome colours". London: The Guardian. Retrieved December 26, 2011. ^ "Rocnow.com". Rocnow.com. Retrieved January 19, 2012. ^ "S&P ousts Kodak, but its shares rise". Democrat and Chronicle. 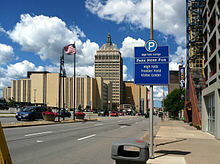 Rochester, New York. December 12, 2010. ISSN 1088-5153. Retrieved December 13, 2010. ^ Spector, Mike; Mattioli, Dana (September 30, 2011). "Kodak Hires Restructuring Lawyers". WSJ. Retrieved September 30, 2011. ^ "Beleaguered Kodak faces delisting from NYSE". Chicago Tribune. January 3, 2012. Archived from the original on January 6, 2012. ^ Humer, Caroline (January 10, 2012). "Struggling Kodak film group split up, shares soar". Reuters. Retrieved January 15, 2012. ^ Jarzemsky, Matt (January 10, 2012). "Kodak separates business into consumer and commercial segments". The Australian. Retrieved January 15, 2012. ^ "Photography icon Eastman Kodak has filed for Chapter 11 bankruptcy. –". Usatoday.com. January 19, 2012. Retrieved January 19, 2012. ^ "Truesense Imaging Announces Independent Operation - Truesense Imaging, Inc". Truesenseimaging.com. Retrieved March 3, 2013. ^ "Kodak to Cease Digital Camera Production". PC Magazine. February 9, 2012. Retrieved February 9, 2012. ^ "Kodak Focuses Consumer Business On More Profitable Growth Opportunities". Kodak. February 9, 2012. Retrieved February 9, 2012. ^ "Kodak to sell film business that made its name". The Chicago Tribune. August 24, 2012. Retrieved August 24, 2012. ^ Jones, Roland. "Kodak plans to cut another 1,000 jobs". NBC News. Archived from the original on September 19, 2012. Retrieved September 10, 2012. ^ "Kodak in $525 mln patent deal, eyes bankruptcy end". Reuters. December 19, 2012. Retrieved December 20, 2012. ^ "Kodak selling two businesses to pension plan". USA Today. April 29, 2013. Retrieved October 1, 2013. ^ "Kodak emerges from Chapter 11". Screen Daily. September 4, 2012. Retrieved September 13, 2012. ^ "Video "The opening of the new Kodak"". October 17, 2013. Retrieved October 25, 2013. ^ "Video "Jeff Clarke's Message to Employees"". March 12, 2014. Retrieved March 12, 2014. ^ Velazco, Chris. "Kodak's finally making smartphones (sort of)". Retrieved December 26, 2014. ^ Burgess, Matt (October 20, 2016). "Hands-on with Kodak's £449 Ektra – the camera maker's first phone". Wired. Conde Nast UK. Retrieved December 22, 2016. ^ "Loading site please wait..." www.kodak.com. Retrieved 2017-08-24. ^ Frankel, Todd C. (January 6, 2017). "Kodak says it's bringing back Ektachrome film, and photographers everywhere are smiling". The Washington Post. ^ "KODAK EKTRA, the Camera-First Smartphone, Launches in the United States". www.kodak.com. Retrieved 2017-08-24. ^ "KODAK Tablets launch throughout Europe". www.kodak.com. Retrieved 2017-08-24. ^ Shah, Saqib (2018-09-25). "Kodak's retro Ektachrome film arrives after a long wait". www.msn.com. Retrieved 2018-09-26. ^ Jeremy Herron, "Kodak Surges After Announcing Plans to Launch Cryptocurrency Called 'Kodakcoin'," Bloomberg Businessweek, January 9, 2018. ^ "Kodak Proclaims, 'We Are Ready' for Whatever Life after Chapter 11 May Bring". September 6, 2013. Retrieved November 11, 2013. ^ a b "Update: Kodak exits Chapter 11". PrintWeek. September 4, 2013. Retrieved November 11, 2013. ^ "AP EXCLUSIVE: Kodak CEO talks company's future". September 3, 2013. Retrieved November 11, 2013. ^ "Me & my: Kodak NexPress SX3900". PrintWeek. September 30, 2013. Retrieved November 11, 2013. ^ "Tried & Tested: Kodak Digimaster". January 21, 2011. Archived from the original on November 13, 2013. Retrieved November 11, 2013. ^ "KODAK FLEXCEL NX System - Kodak Graphic Communications Group". Graphics.kodak.com. Retrieved December 11, 2011. ^ "Kodak Sees Bright Future in Imaging for Business". September 5, 2013. Retrieved November 11, 2013. ^ "Kodak, Kingsbury ink deal on touch-screen sensors". June 27, 2013. Retrieved November 11, 2013. ^ "Kodak, UniPixel have renamed their touch-screen sensor line". September 25, 2013. Retrieved January 31, 2014. ^ "Kodak To Buy Heidelberg's Digital Business". In-plant graphics. April 1, 2004. Retrieved September 2, 2015. ^ "Digital Printing Solution - Kodak Graphics Communications Group". Eastman Kodak. ^ "Kodak Revolutionizes the Inkjet Industry". Eastman Kodak. February 6, 2007. ^ "Kodak to stop selling inkjet printers from 2013". Reuters. September 28, 2012. Retrieved September 28, 2012. ^ "Kodak Emerges From Bankruptcy". Variety. September 3, 2013. Retrieved January 31, 2014. ^ "Kodak sells British visual effects house Cinesite". Los Angeles Times. May 10, 2012. Retrieved January 31, 2014. ^ "LAC Group Acquires Kodak's PRO-TEK Film Preservation Subsidiary to Expand Information Curation and Stewardship Services". October 16, 2013. Retrieved November 11, 2013. ^ "Polaroid Corp. v. Eastman Kodak Co". October 12, 1990. Archived from the original on June 9, 2007. ^ "History — Truesense Imaging, Inc". ^ "Weave Innovations StoryBox". Gadget Central. April 4, 2000. ^ Scoblete, Greg (March 12, 2001). "Digital Frames Make Inroads In Consumer Market". Twice. Archived from the original on October 14, 2007. Retrieved January 7, 2008. ^ Rubin, Ben Fox (March 1, 2012). "Kodak Agrees to Sell Gallery to Shutterfly". Wall Street Journal. Retrieved March 12, 2012. ^ "Insurance | Case Studies | Gore Success Story". Microdea.com. Archived from the original on July 14, 2011. Retrieved December 11, 2011. ^ "Kodak to Stop Making Black-and-White Paper". Fox News. June 16, 2005. Retrieved January 7, 2008. ^ "KODAK, Esprida offer Remote Business Manager for photo kiosks". Kiosk Marketplace. October 10, 2006. Archived from the original on December 13, 2007. Retrieved January 7, 2008. ^ "KODAK Adaptive Picture Exchange (APEX)". Kodak. June 24, 2010. Retrieved September 28, 2016. ^ Nemenoff, Ben. "Houston, David Henderson". nd.gov. Archived from the original on May 30, 2010. Retrieved September 5, 2010. ^ T. H. James, Journey: 75 Years of Kodak Research (Eastman Kodak Company, Rochester, 1989). ^ Burley, Robert (February 21, 2007). "Back to the Future - Photography in the 21st Century, February 21, 2007". The Photographic Historical Society of Canada. Retrieved October 1, 2011. ^ "Special Collections: Kodak Canada Corporate Archives and Heritage Collection". Ryerson University Library and Archives. Retrieved October 1, 2011. ^ "Eastman Kodak Resigns from Council of Better Business Bureaus After Expulsion Proceedings are Initiated". Better Business Bureau. March 26, 2007. Archived from the original on February 1, 2014. Retrieved January 31, 2014. ^ Don Reisinger, CNET. "Kodak wins key battle in Apple patent case." May 13, 2011. Retrieved May 13, 2011. ^ "Notice of Commission Determination" (PDF). "You Press the Button, We Do the Rest"
This page was last edited on 16 April 2019, at 16:30 (UTC).